Practical ideas and advice to support pupils living with autism. Advocates for a whole-school approach. 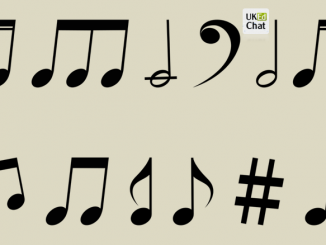 Helps teachers develop subtle learning strategies. Encourages an inclusive, quality teaching environment supporting pupils with autism. With the many challenges faced by teachers on a daily basis, supporting pupils with autism can drop down the priorities, as other tasks demand equal and urgent attention. 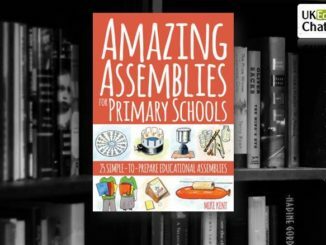 It’s a travesty, as some of the most brilliant and creative pupils who go through our classrooms live with autism on a daily basis, and supporting their specific and unique perspectives can demand time, attention and careful planning. Identifying autism in pupils may have previously been neglected, and many traits may only emerge as individuals go through adolescence. The role of the secondary school teacher in supporting all individuals throughout this critical phase of development can be a juggle with the competing demands of school and curriculum objectives. Mostly, a whole-school approach to supporting individuals is one of the best policies, but putting this into practice demands time, support and inclusion of all the adults who encounter our students each day. 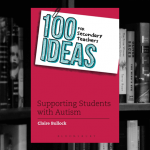 Fortunately, support is there, and the Claire Bullock has compiled a fantastic resource demonstrating, “100 Ideas for Secondary Teachers: Supporting Students with Autism“. Split into eight important sections – good practice; transition and change; support for anxiety and behaviour; behaviour; social skills and relationship development; the physical environment and sensory considerations; curriculum, testing and homework; monitoring, tracking and paperwork – Claire has created 100 fantastic ideas which include teaching tips, extending ideas further, and original bonus ideas that can support all adults working in secondary school in supporting pupils with autism. Throughout the book, it is clear that autism should not be used as an excuse to hold students back, but by supporting them to celebrate the individual nature of their situation, they can thrive and cope with situations just like all members of a school community. 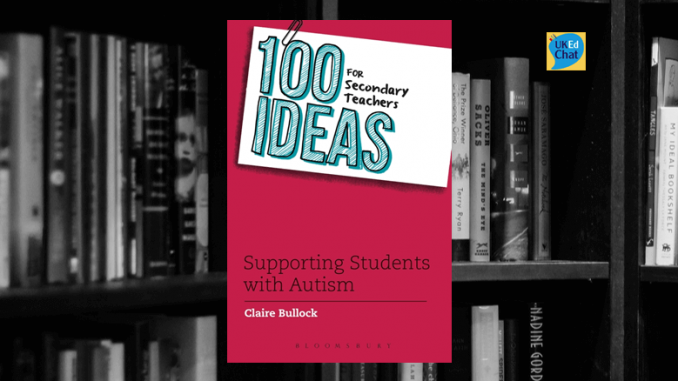 This book is important and should be firmly utilised in all secondary schools, offering support for teachers who may be unaware of the challenges of daily situations faced by those living with autism. Claire Bullock is an authority on working in the autistic arena, and the ideas and advice all flow from her experiences working on a daily basis with children with autism. Prices stated correctly at the time of publication.